The National Center for Remote Sensing, Air and Space Law is pleased to announce a new, comprehensive website. As with its previous site, the Center’s blog, Res Communis, and all of its publications, including the Journal of Space Law back to 1973, are also accessible through the new site. The new website also includes many new features. The most important of these is the Center’s Space Law Archive. Now, researchers can access the papers of early space law pioneers Andrew G. Haley, Eilene M. Galloway, and Stephen Gorove. Other new features include an Air and Space Law Calendar and a Did You Know? feature that serves up random important facts about air, remote sensing and space law. Finally, the website is completely social network enabled with Digg, Facebook, Google, Myspace, StumbleUpon, Twitter, and many more options. We are offering this website to the community as a public service. If you have any ideas or comments about how to improve it for your use, please let us know. 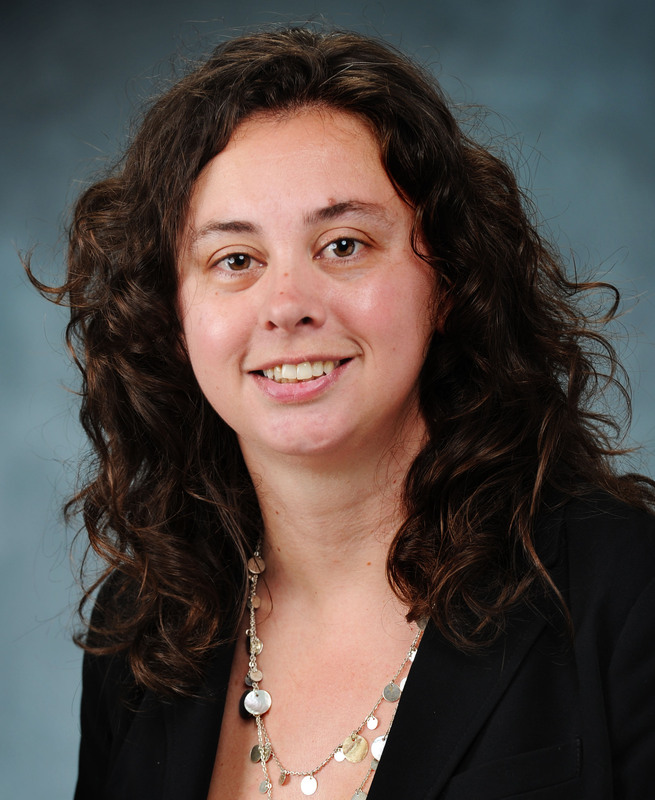 The National Center for Remote Sensing, Air, and Space Law is pleased to announce that Ms. Audrey Uffner has joined the staff as Coordinator of Archival Services. Ms. Uffner is currently processing the Center’s archival collections. The Center has a growing collection of papers and other primary documents that once belonged to some of the most important members of space law’s founding generation. They include the papers of Andrew G. Haley, the world’s first space law practitioner; Eilene M. Galloway, the woman who created space law with then Senator Lyndon B. Johnson and whom NASA calls one of its creators,; and of course, the University of Mississippi Law School’s own Stephen Gorove. Ms. Uffner was a proofreader and writer for the Legislative Reference Bureau of the Commonwealth of Pennsylvania and an intern with the Pennsylvania Historic and Museum Commission at the Pennsylvania State Archives. She worked for the Archives and Special Collections and the Modern Political Archives of the J.D. Williams Library at the University of Mississippi. 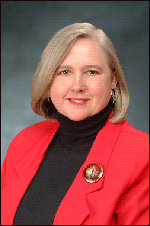 She began at the University of Mississippi in 2003. Before joining the Center, she served as an Instructor for the Department of History at the University of Mississippi and research assistant for the Center for Civil War Research. Ms Uffner is completing her dissertation, which focuses on the role of secession in the lives and political careers of Mississippi politicians and planters from 1840-1880. She earned a B.A., from Gettysburg College, an M.A. from the University of Mississippi where she is currently a Ph.D. candidate. Ms. Uffner is a member of the Society of American Archivists, the American Historical Society, and the Society for Historians of the Early American Republic. An early space law document concerning the structure of the legal regime in outer space has been discovered in the Haley Archive. The document is titled Resolution Concerning the Legal Regime of Outer Space Adopted Unanimously on 11 September 1963, and was the product of The Institute of International Law (Institut de Droit International) in Brussels during September, 1963. Drafted in both French and English, the document describes a number of principles that the Institute believed should be incorporated into a future treaty or declaration governing the legal regime of outer space, and many of its provisions draw parallels to articles found in some of the United Nations Treaties and Principles on Outer Space. The Resolution came after the passage of the United Nations Resolution 1962 (XVIII), known as the Declaration of Legal Principles Governing the Activities of States in the Exploration and Use of Outer Space, but it preceded the Treaty on Principles Governing the Activities of States in the Exploration and Use of Outer Space, Including the Moon and Other Celestial Bodies, which entered into force in October of 1967. Principle 1 notes that “outer space and the celestial bodies are not subject to any kind of appropriation, they are free for exploration and use by all states for exclusively peaceful purposes. . . ”, utilizing similar language as that of Outer Space Treaty’s Article I. Principles 3 and 5 concern registrations and jurisdiction, with Principle 3 noting that “every launching of a space object shall be registered by the State under the authority of which the launching took place” and Principle 5 noting that “every space object . . . shall remain subject to the jurisdiction of the State under the authority of which it was launched”. The essence of these Principles was incorporated into OST Article VIII. Principle 8 notes that “States shall take appropriate measures for: a) mutual assistance among astronauts; b) mutual assistance among States on behalf of astronauts in need of assistance; c) prompt repatriation of astronauts after any emergency landing or rescue”. These concerns were addressed both by the OST Article V and the Agreement on the Rescue of Astronauts, the Return of Astronauts and the Return of Objects Launched into Outer Space. Finally, Principle 13 notes that “the State under the authority of which the launching of a space object has taken place shall be liable, irrespective of fault, for any injury, including loss of life, or damage that may result”, echoing the sentiments of the OST Article VII. 12.4: IAF-IISL – Colloquia, Proceedings of . . . . . .
An early space law document concerning the logistics of the rescue of stranded astronauts and cosmonauts has been discovered in the Haley Archive. The booklet, titled Space Rescue—An Opportunity for International Cooperation in Space, was prepared by the “Martin Company of the Martin Marietta Corporation” for public presentation at the Eighth Colloquium on the Law of Outer Space, held in conjunction with the Sixteenth International Astronautical Congress in Athens, Greece, held September 14-15, 1965. The booklet contains a number of intriguing facts, historical data, hypotheses and predictions for future human interaction in outer space, and proposals for the proper rescue plans needed to aid stranded individuals. The crux of the document is the argument that an international rescue service should be created to promote the cooperation of space faring nation-states and the safe return of stranded astronauts and cosmonauts. The document is divided into three Parts. Part I concerns a “New International Need”. It discusses the global and national repercussions of possible disasters that occur in space, noting the outrage that would be created if no means of rescuing astronauts or cosmonauts existed. Part I also states that the problem of space rescue will eventually affect more than the U.S.A. and the U.S.S.R. Part II discusses the risk to astronauts and cosmonauts, and extensively utilizes a probability analysis of an “assumed manned mission matrix”. Part III discusses the then -proposed “International Space Rescue System”, noting that this could be a humanitarian enterprise to unite the efforts of the Earth’s most powerful nation-states in a field of great sensitivity. Part III is divided into five subsections. In the first, the need for a “Space Rescue Code” is promoted, and notes that the code “would merely establish a policy to guide the action of each country in relation to the rights of others in handling distressed spacecraft, particularly in their recovery from space and in their emergency landing upon foreign territory”. Step two would involve an agreement between the U.S.A. and the U.S.S.R. to implement a firm schedule concerning when the rescue service would be effective. Step three aims to promote increased cooperation between the U.S.A. and the U.S.S.R., including an exchange of information and parallel proficiency exercises. Step four involves the participation of friendly nationals on each side of the agreement. Finally, step five involves joining the independent allied organizations into a single group, and notes that eventually this organization may grow and be subsumed within the ambit of the United Nations, albeit in such a way as to preclude diminution of national sovereignty. Perhaps most interesting of all is that the document preceded by three years the adoption of the Agreement on the Rescue of Astronauts, the Return of Astronauts, and the Return of Objects Launched into Outer Space, Apr. 22, 1968, 19 U.S.T. 7570, 672 U.N.T.S. 119 (Return and Rescue Agreement). Though Martin’s plan is different than the eventual Return and Rescue Agreement, it embodies the same spirit of international legal cooperation designed to ensure the safe return of astronauts and cosmonauts proposed at the 1965 Space Law Colloquium. This post is part of a series of posts on the 3rd Eilene Galloway Symposium on Critical Issues in Space Law. A list of all the posts can be found in the Wrap Up. Andrew G. Haley was the author of one of the world’s seminal space law texts, Space Law and Government (Appleton-Century-Crofts1963). He is widely considered the world’s first space lawyer. Some of Haley’s papers were given to the late Stephen Gorove, upon whose work the NCRSASL was based. The Center is now processing these papers as the Andrew G. Haley Archive which will be made available to researchers. 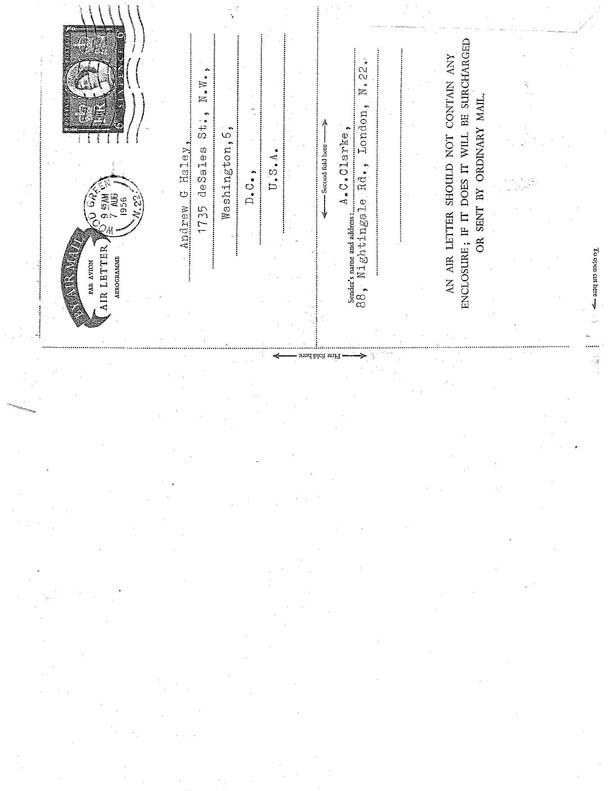 From time to time, the Center makes available interesting individual documents as they are discovered. This document is from Haley to Chief Justice Earl Warren with a request to use the Supreme Court Building as a venue for the Annual Congress of the International Astronautical Federation. This document is a letter from Chief Justice Earl Warren in response. Andrew G. Haley was the author of one of the world’s seminal space law texts, Space Law and Government (Appleman, Century, Croft, 1963). Some of his papers were given to the late Stephen Gorove, upon whose work the NCRSASL was based. The Center is now processing these papers as the Andrew G. Haley Archive to be made available to researchers. The letter below was written by Clarke to Haley in 1956 and was discovered this week during the continued processing of Haley’s papers. 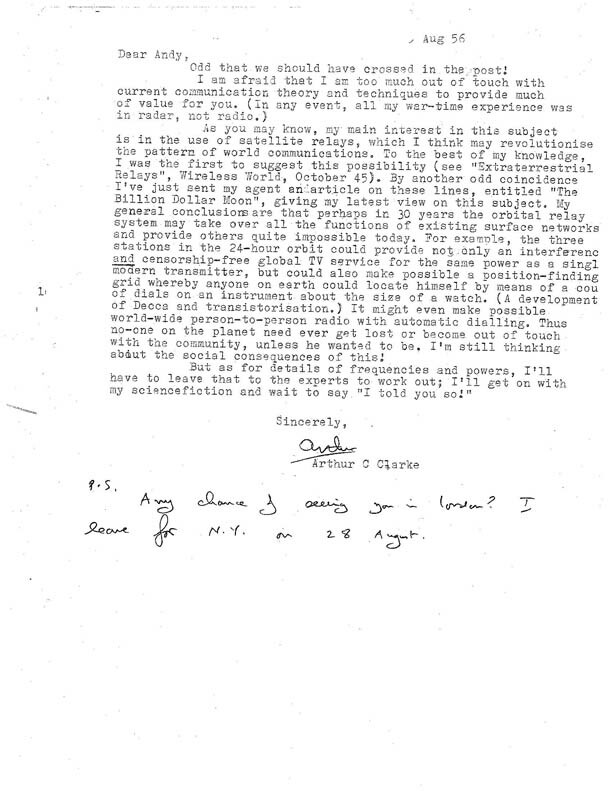 Given the recent passing of Arthur C. Clarke, the Center decided that this letter will be of particular interest to the space community at this time. Therefore, we are making it availbale through Res Communis at this time.